The humble pickup has always been seen as the truck of the working man, cold and austere, designed more for practicality than pleasure. And while there are trucks in the Ford F-150 lineup that eschew creature comforts in favour of a sober, no-nonsense approach—the 2019 Ford F-150 Limited is not one of them. This top of the line trim level F-150 takes Ford’s best selling truck to dizzying new heights. There’s certainly nothing reserved about the 2019 Ford F-150 Limited’s performance. Borrowing the high-output 3.5L V6 EcoBoost® engine found in the Raptor, the F-150 Limited produces 450 horses and 510 lb.-ft of torque. Even with Ford’s exceptionally efficient electronic 10-speed transmission, that means you’ll still hear a healthy growl coming from the Limited’s dual exhaust. Electronic locking rear differential, AdvanceTrac® with Roll Stability Control™, and a fully boxed steel frame provide a disciplined ride to go with all of that power. So whether you’re putting in time on the highway or the job site, you know the 2019 F-150 Limited will be able to handle the drive in a smooth and efficient manner. Luxury can mean different things to different people, so the real question is what does it mean to you? Are you looking for a dapper truck on 22” polished aluminum wheels? Are you looking for a luxuriously-appointed interior full of leather inserts, leather heated and cooled seats, a Twin-Panel Moonroof, and premium 10-speaker Bang & Olufsen sound system? Or perhaps your idea of luxury is standard driver assistance features, like Adaptive Cruise Control with Stop-and-Go, Pre-Collision Assist with Automatic Emergency Braking, Lane-Keeping System, Pro Trailer Backup Assist, and BLIS® (Blind Spot Information System)? 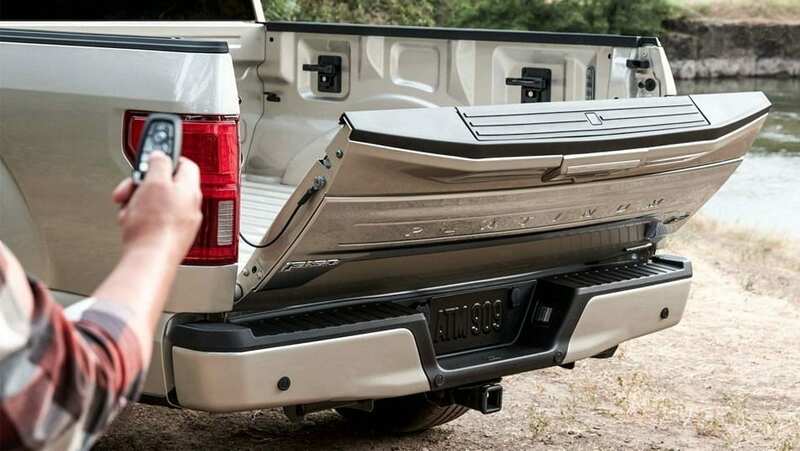 Because the 2019 Ford F-150 Limited offers all of these luxuries, and more. Ford’s most impressive truck yet —and that’s really saying something— is available now at Edmonton’s favourite Ford dealership, Team Ford. Book a test drive today, and learn how Ford’s taken the once humble pickup truck and transformed it into one of the most luxurious vehicles on the market.